Les is a tall, fit-looking man of middle age with an authoritative but casual and relaxed way about him. I first heard of Les when a friend was working in website development at Social Change Media, the company Les started in the 1990s. He’s now acknowledged as one of the country’s leading thinkers and educators on social change, and last year led a popular ‘Passion Mashin, how to revive your community group’, workshop at the community centre. Late last year he published the book, Changeology. Demand was such that the course was fully subscribed and a waiting list started for those who missed the booking. Participants included some who had done council’s Living Smart and Organic Gardening courses, a member of Transition Bondi, two from Permaculture Australia and others who work with communities or individuals in change, including in the health field. It was evident that there was a need to understand and facilitate change across a broad field of community and service organisations. We leaned that fear acts as a clamp on people making change. It comes in a number of forms but one of the most persistent is the fear of being judged by others. Like a dark demon from the underworld with a firm, ferocious, clawed grip on the leg of someone trying to escape it, this fear of peer judgement holds people back from making positive change in their lives. Dealing with fears is one of the things that change facilitators do, Les explained. Offering hope and enabling change through reducing the fears that hold people back, and inviting people to participate in change, is a three-pronged strategy for enabling change. It’s still a belief that to create change we have to first raise awareness then give people the knowledge to go and make the change they desire. Not so, because there is no direct connection between awareness raising, knowledge acquisition — the old knowledge deficit model remedied by pouring information into people’s heads — and actually making change. Despite this, organisations, lobbies and even councils persist in spending money on glossy brochures in the belief that making people aware of the costs of continuing to do something, and attempting to educate them in a better approach, will lead to the desired change. Providing information has a role, but as background for those making change through other means. Awareness raising and supplying knowledge are not necessarily routes to change, it turns out, which is a facilitated process. And it’s much the same with threats, a technique especially beloved by government which spends much taxpayer money making little signs threatening dire consequences if we don’t do what they want us to do. Government especially likes the ‘carrot and stick’ approach of offering an inducement at the same time as making a threat if people don’t do what they want. By demonstrating a deficit of understanding and skill like this, and treating adults as if they were naughty little children, is it any wonder Australians hold politicians and government in contempt? The resistance to being told what to do, a traditional Australian characteristic, is what Les spoke of. According to Les, ‘tell, sell or threaten’ approaches don’t work because they encourage denial that there is some problem, which can lead to people engaging more frequently in it. They generate resistance to being told that we are wrong and what we should do. To encourage adoption of a new idea we call for assistance from the Ideas Diffusion model developed some decades ago by Everett Rogers. It plots the adoption of an idea on a timeline, starting with the inventors of the idea, passing initially to the early adopters, on to the early mass adopters, then into the later mass adopters and, finally, on to the laggards who resist change. Knowing this, we can tailor the way we communicate with people at different stages of change so as to address their fears and their mindset. In doing this our choice of language is very important. 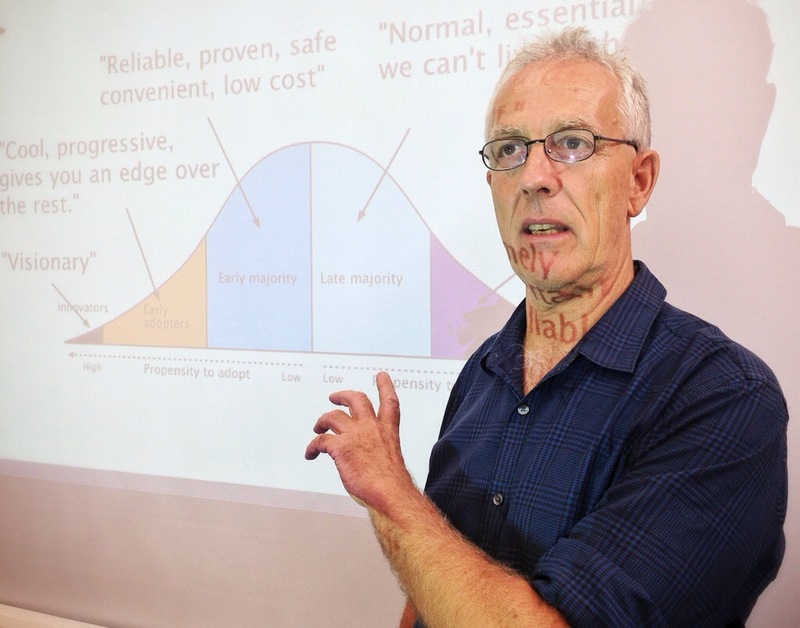 For any of us working with groups in change-making, knowing where those we are assisting are on the bell curve of readiness for change is important. Learning that is one of the first things a change facilitator does with a group. People attending a workshop like Changeology, Les suggested, are likely to be early adopters because it is they who seek out opportunities. Imagine this. In the days when you could open train windows, back, say, in the 1920s, a female passenger on the Blue Mountains line engaged in her own civic beautification project by throwing the seed of the daisy-family flower, Coreopsis, from the train window. Coreopsis is a bright yellow annual flower that forms a beautiful meadow-like effect, and is appreciated by bees. That was the starting point of the storytelling exercise of the group I was with. Story telling? Yes, you don’t get far in change-making without a good story. A good, positive story about people successfully making change, that is, like that passenger and her flower seed. We were soon creating ideas and adding to out team’s story. The tale of the female coreopsis lover soon morphed into story about train guards throwing out flower seeds on the run to Katoomba. Then came the idea of the linear garden along the railway corridor… then the idea that these flowers could be tended by bees housed in hives located in the corridor. This was then embellished to become a story about railway corridors as bee forage gardens of flowering species, with the resultant honey sold with a ‘Railway Honey’ label at the train stations on the Blue Mountains line. This, we thought, would be a fine new enterprise for State Rail. The story had both surprise and engendered the emotion of enthusiasm, surprise and emotion being necessary components of sticky stories. One participant said she would now like to make this happen. A sticky story like this stays in peoples’ minds, and a story with both surprise and emotion in it makes it catchy and memorable. The key to learning to write and tell sticky stories, for Les, comes in the form of the Heath bothers’ book, Make It Stick. We learned to write our own sticky stories using the elements in that book. It was a common experience that unfacilitated meetings usually go nowhere and become dominated by the assertive, the loud-voiced and verbose — they are a waste of time, in other words. Understanding the importance of good facilitation and trying it was the final activity of day one of this course. The importance of having a clear purpose, establishing agreed ground rules, peer-to-peer interaction, pacing and having an enjoyable structure were covered. There’s was more on the important role of facilitation the following week. One of the most important things in working with groups in change is enjoyment and fun rather than drudgery and exhaustion. An element in this is food, and it was no coincidence that participants appreciated the salad lunch, some of it from Sydney region farmers, that course organiser, Fiona Campbell, provided. It’s common to hear from people in community organisations and even council sustainability educators complain that they get the same people coming to their workshops and courses time after time. They bemoan ‘preaching to the converted’, however they don’t understand the change process and how ideas travel through society. Apart from preaching and lecturing being the wrong things to do, making that statement suggests a lack of understanding of how change often starts with people you know, with the early adopters of the Diffusion of Ideas model. It is these people who come along to learn about a new idea because they are the social group ready to make change, ready to try it out. In many cases they are also the group ready to spread change. The role of the course or workshop then becomes that of educating those who want to learn. Like a rock thrown into a pond of still water, those early adopters will go out and, just as the rock exerts its influence by spreading ripples across the pond, they influence others through example and discussion with people they know. This is the ‘ripple effect’ and it puts the notion of preaching to the converted into quite a different light. Often, those people who complain that the same people continually turn up to their workshops talk of educating ‘mainstream people’. This vague term suggests there exists an undifferentiated mass out there somewhere, if only community educators could get to them. This misses the point that we work with those ready to learn and give them the capability to constructively and skilfully influence others. You don’t sweat the laggards, according to Les. In engaging with people to create change, we start with our circle of influence. This might be friends and acquaintances, workmates or people in organisations we are a member of. It is different to our circle of concern, those wider things we would like to change but have no direct influence over. We start with small steps and don’t push people out of their comfort zones. Instead, we expand their comfort zones through familiarity with new ideas and by reducing their fear of trying something different. Don’t try to convince people. Instead, talk about yourself — ‘I did this’. Don’t say ‘you could do this’. You can’t make people do anything. The less pressure to change or do anything, the better. People change when they see someone living their own dream and ask, ‘why can’t I?’. Observation becomes motivation, and motivation, action. Experience, what people do, matters more than education, said Les. Sometimes we have to attempt to influence people. A way to do this is to create an inspiring pitch. First, we grab attention by asking an easy to answer, engaging question or to break the ice. Then we share an emotional, personal story about what inspired us in our work and share a picture of the desired future we hope to achieve, not by focusing on the problem but by talking about what we would like in a touching and hopeful way that describes what it would feel like. We do this by using emotive words. The idea is to sketch a quick picture of our idea and how it works, establishing credibility for it. We don’t argue of persuade but we briefly present compelling evidence that supports our idea. Before we deliver this pitch we anticipate risks and criticism and think about how we would answer these. It’s not possible to anticipate all potential criticism, of course, but some are likely to be obvious. Think about what people’s fears could be. Don’t tell people what we think they should do, and conclude by making a call to action. Then, stop talking and listen to what people have to say. Community groups, especially those set up to create change of some sort, sometimes run out of steam. Meetings become formulaic, following the same pattern time after time. They are all business with no time to talk about anything else. Poor or no facilitation allows the verbose to dominate and makes meetings longer then they need be. People become bored and, sooner or later, attendance at meetings starts to decline until there’s only a handful of diehards left. • having an important purpose. The Changeology course is part of the Randwick Council sustainability team’s community leadership program to improve the skills of those involved in community organisations, NGOs, social enterprise and small business. Offered as courses and workshops over a couple years, it includes training in leadership, facilitation, group processes and communication. It is courses such a this, and the Organic Gardening, Gardening on the Wild Side and Living Smart courses that is Randwick Council’s point of difference to other councils that offer only short workshops. Next up in 2014 as part of the community leadership series, professional facilitation business, Unfolding Futures, will lead a two day course in direction setting and strategic questioning for groups. This offers an antidote to those interminable, argumentative and joyless ‘strategic planning’ (a grossly overused and misunderstood term) meetings that do more to discourage rather than encourage people to work together in creating positive change. Get the book: Changeology — How to enable groups, communities and societies to do things they’ve never done before.